Penders and Flynn (and Bollers and Sega) could write a bad romance. 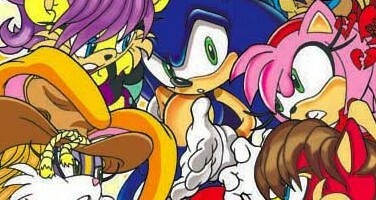 In Sonic’s long history of cartoons, comics and games, he’s had quite a few ladies. Hell, in the comics he’s had enough women to make Captain Kirk envious. However, many of these relationships did not work out so well or were just a horrible HORRIBLE idea in the first place. Sometimes, love stinks. Read on to find out who made the list. Also, when you have to us Google image search to find images of Sonic’s old GF’s for an article, PLEASE USE SAFE SEARCH!! I learned the hard way. A.K.A. How Scourge got his groove back. Scourge is the kind of Sonic character I’d normally hate. He looks like a fan character re-color and he’s evil only because he’s a Sonic from another world where everyone’s morals are in reverse. The good guys are bad and the bad guys are good. The McDLT’s are always ruined because the hot side stays cool and the cool side stays hot. But I’ll be danged if Ian Flynn doesn’t know how to write the guy in a way that always makes for a fun story. 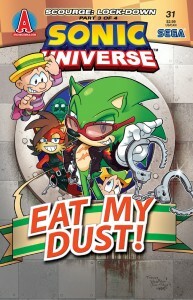 He’s basically a parody of Sonic with all of Sonic’s cockiness and arrogance turned up to 11. It makes you end up liking him BECAUSE he’s a jerk rather than in spite of. The story begins with Scourge at the lowest point of his life. 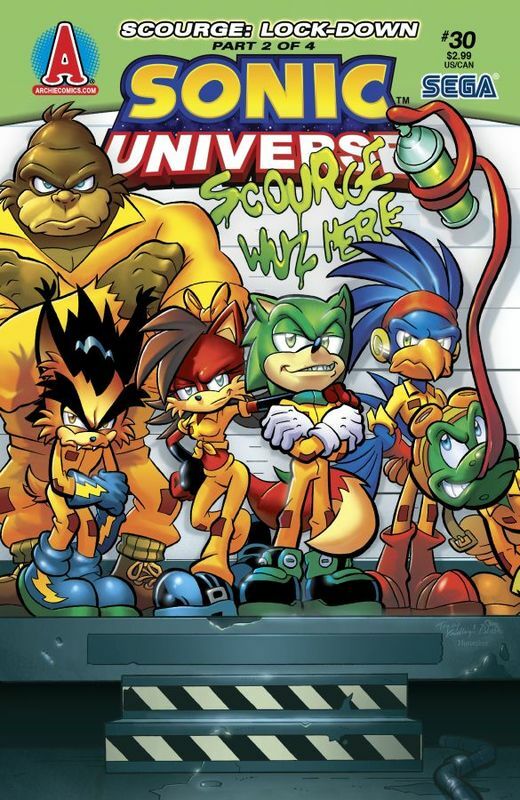 After turning into Super Scourge and coming very close to defeating Sonic for good in “Hedgehog Havoc”, he was ultimately defeated and put into the No-Zone inter-dimensional prison where he is picked on and beaten every day thanks to an inhibitor collar that kills his speed powers and dampens his normal abilities. His only “friends” are Al and Cal (AKA Horizont-Al and Verti-Cal). An odd duo from much earlier Sonic tales. They are are sort of mystical Elmer-Fudd-looking beings who are gods in their own dimension. 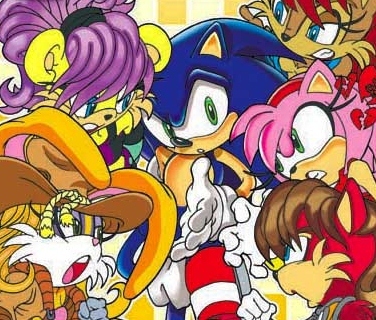 They take pity on Scourge and try to befriend him. They’ll find out later that no good deed goes unpunished. Scourge has given up so badly that he doesn’t even bother to fight back at all. It’s a good start in the first issue as it makes you have sympathy for the devil. Luckily for him, his girlfriend Fiona comes in and gets herself along with the Destructix. She needs Scourge for a big job and has a plan to bust him and the Destructix back out of prison. At first Scourge refuses and yells at Fiona for possibly getting him killed since anyone building up a gang in prison is targeted for extermination by the evil King Max. But soon he realizes he needs them to escape and has to regain their trust over the next four issues as they plan their big breakout. Now, you may be asking yourself, “What’s the No-Zone?” Well, much like DC’s infinite earths, there are multiple Mobius worlds across many dimensions. The No-Zone contains a police force that tries to stop any criminals who would misuse cross-dimensional traveling. Yes, there are alternate versions of our favorite Sonic characters in this dimension, but they all begin with the letter Z. Zonic, Zector, Zouge and Warden Zobotnik. This is where some of the real fun of the book lies. Because it takes place in an inter-dimensional prison, there are opportunities for some fun cameos. 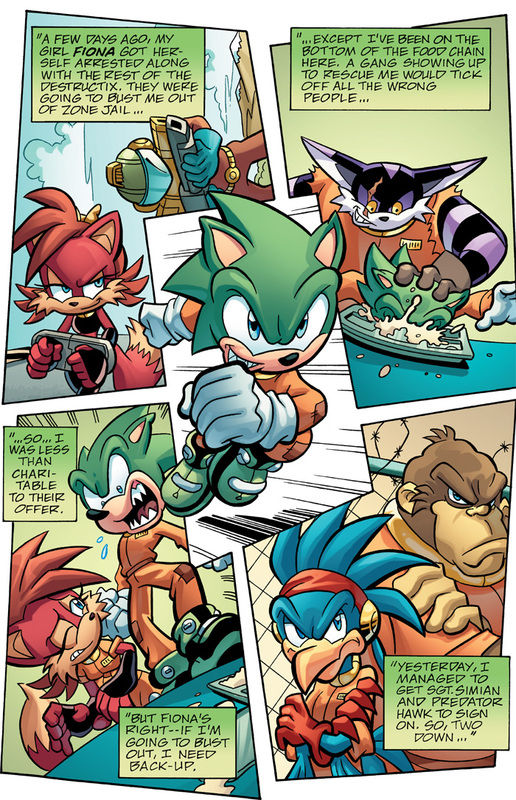 You’ll be scouring the artwork to see some of them including the Werehog (twice in the off-panel strips), a muscle-bound Amy, an Angry Bird, Void, Bebop and Rocksteady, even Mephilis shows up to deliver the funniest line in the story. This story arc has everything. Good humor from the many cameos and other jokes. Great character development for Scourge as he goes from punching bag to king of the hill. But mostly, we finally get to see the back stories of the Destructix and more on Fiona. Before this arc, the Destructix were just a group of villains with little known about them. Since Scourge has to regain their trust if he wants to get out, he gets to know each one and in turn we get to know a lot more about them. Fiona’s back story is a bit tragic as she recalls her tough past and has learned to rely on no one but herself. Yet, here she goes and risks long term imprisonment to rescue the man she loves who only seems to love himself. While, the first three issues is mostly all about character exploration and development, the fourth issue is all-out action as the prison escape takes up almost the entire issue. Scourge gets to show the great leader he can be even when he’s going back into the prison to get petty revenge on the inmates who mistreated him. He also “rewards” Al and Cal which helps cause a great distraction. Does he escape? Does anyone get left behind? I’ll leave it to you to read and find out. While I did enjoy this story arc immensely, I do have some minor nitpicks to discuss. First off is the inhibitor collars the inmates wear. While they do seem to cut off any powers, they also seem to barely dampen anyone’s natural abilities. Flying Frog can still shimmy his skinny body through prison bars and use his long tongue as a weapon. Sgt. Simian can still bench press a few hundred pounds and Lightning Lynx still seems to have his ninja abilities. In short, it almost makes these collars seem kind of pointless outside of tracking everyone. Also (Spoilers folks!) I have a problem with the Deus Ex Machina that helps them in their escape attempt. It’s in a box with their normal belongings when they were first brought in. I won’t say what it is but I doubt a Zone guard would not recognize it and what it does. I would have liked a better explanation of how they sneaked it in. 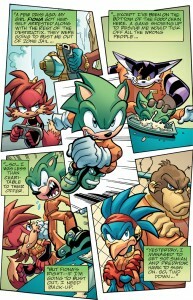 That said, Scourge: Lockdown is the best Sonic story arc this year. It’s highly entertaining, full of humor and gives great insight to the characters. As usual Tracy Yardley does a great job with the artwork and gives us tons of cameos to scour the book to find. I recommend picking up these issues at your local comic store, or you could wait a year or two for the graphic novel version. Either way, if your a Scourge fan, it’s a must read. 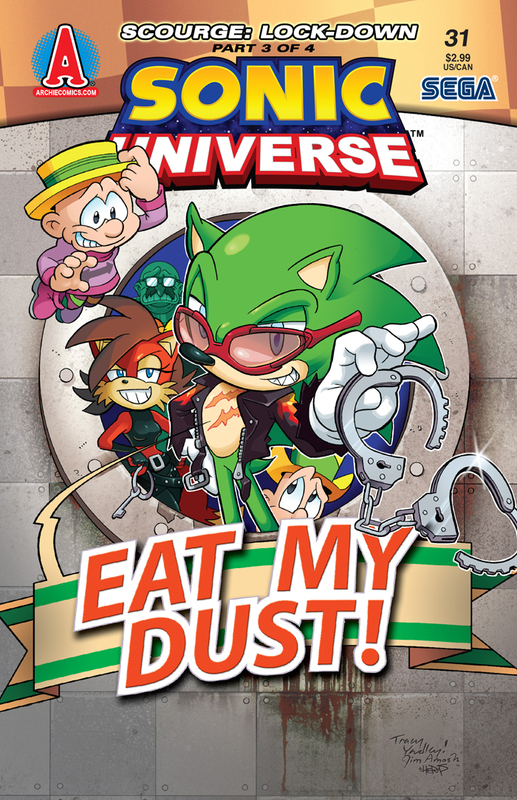 By the way folks, i’m going to try to make these Sonic comic reviews to be a regular thing from now on. I’ll be reviewing Genesis in about two weeks when the final part of that story arrives. I’m going to try to do it story arc by story arc, but with the main book having a long, branching story you can expect some single issue reviews as well.